Preheat oven to 450° F. Mix zucchini, onions and mushrooms with the salt, pepper and olive oil; spread mixture on the baking sheet. Roast in the oven for 10 minutes. Stir once and bake until nicely browned. 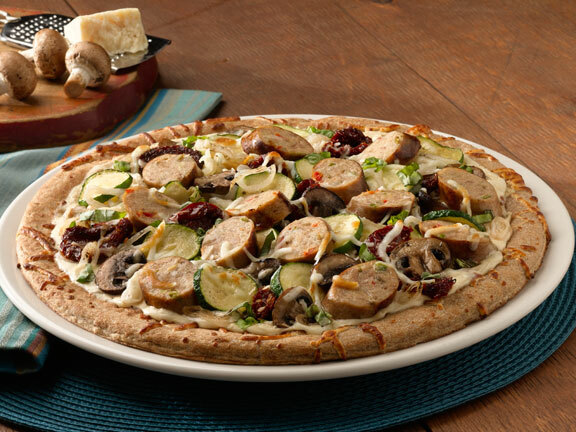 Cut al fresco® Sundried Tomato Chicken Sausage into 1/4" slices, on the bias. To assemble pizza, evenly spread Alfredo sauce over the Boboli® pizza crust, leaving a 1" border. Spread roasted vegetables, basil and chicken sausage. Top with sun-dried tomatoes. Sprinkle with mozzarella and Asiago, bake 8 – 10 minutes or until cheese is melted. Let sit for 5 minutes. Slice and serve.